Selena died in 1995 and in 2015 we celebrate the 20th anniversary of the passing of her body, and the movement to keep her fight for total culture alive. But before we even begin to crack at the political importance of the Selena movement, I need to contextualize the conversation with my grandma, grandpa, and M.I.A. Together, they begin to show the interconnectedness of music and the brown body through history, memory, and communication. In an age where institutionalized racism through police is breaking the voice boxes of young black bodies and we are literally politicizing the words, “I cannot breathe,” there is a particular relevance of the cries, wails, screams, and statements of the colonized body. Those sounds are at the center of why we join mass movements against white supremacy, and we can relate that relevancy to land and therefore to capital. Music has been what many people have used throughout history to survive, communicate, and touch time and space in a collective way. It is with great urgency and desperation that we recognize that the Selena issue of “The Media” is coming out on both International Workers Day, May Day, and during a powerful and tactful moment in the United States, especially Baltimore. Originally, this introduction on Selena Quintanilla Perez was to focus on her effect on intersectionality of race, culture, Mexican Americanism, and the Brown body. She defies aspects of Western beauty and normative music culture both for Tejano music lovers and U.S. Pop music fans alike. Her music became a timeless vessel that lives on long after her body crossed back into the Earth's ground. Malportado Kids at the Selena Memorial in Corpus Christi, TX. In an age where there is great urgency to make connections between members of the cosmic race to build solidarity and a People's history, we need to look at Selena's relevancy through the totality of her physical identity, music, words, actions, and how people are still acting on the hope and the struggle that she represents. This is part of the same struggle that we remember when thinking of other brothers and sisters whose stories contribute to the fight against an imperialized world. Selena’s band was started by her father, who was originally in a doo-wop group; he faced racial discrimination against Mexican musicians when he attempted to play in music venues in Southern Texas. Steadfast to resist cultural white supremacy, he taught all of children musical instruments from a young age. 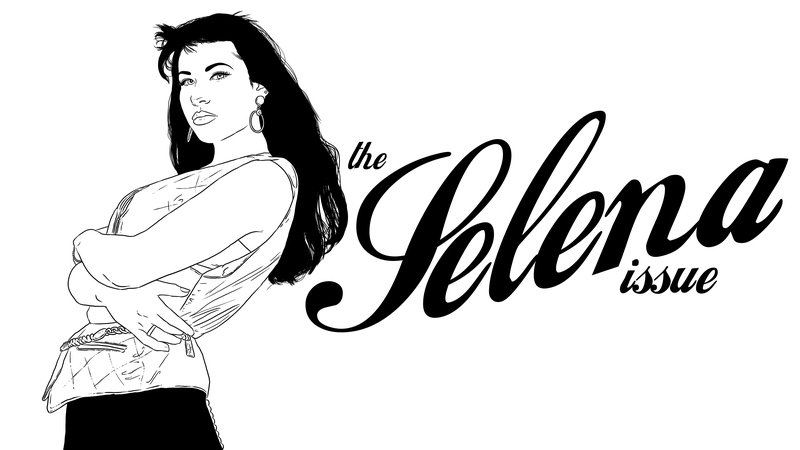 Selena's brother, Abraham and her sister, Suzette, would join a band with Selena and became a musical collective force. In many ways the power dynamic of the band was groundbreaking: Selena held the mic in the front, as opposed to a male musician, and Suzette ripped the drums, both initial breaks from normative Tejano music bands. In 2015, tons of YouTube videos, Google image archives, preserved print images, and Instagram accounts dedicated to Selena provide a visual timeline of her life. Selena did not represent Western European standards of the body. Her weight often fluctuated, her hairstyles were various, and her makeup and clothing were much more in the category of Sun Ra spacesuits than in the category of typical pop singer Cosmo fashion. She made a lot of her own clothes and started her own clothing line. The role of the body in any organized act is crucial, and Selena took it seriously. This is similar to the tactics that we see when femme DIY musicians take control of their physicality in order to create a space or make a vision. It is powerful to see hips, curves, and lips being racialized in a liberating way, without being sexualized in the ways the mass media treats non-White bodies. Selena did not have to do this to be a good singer or to be successful, it was a risk. Selena’s leadership style was uniquely hers in that she did lead many young people, young women, poor people, immigrants. I remember one of the only things that my farm-working cousins and I could really ever relate to, besides our family, was Selena. My cousins would love to debate about her lyrics, her decision to sing in English or cover U.S. American disco songs. And when Jennifer Lopez was chosen to star as Selena in a Hollywood feature film, there was much debate as to why a non-Mexican would play Selena. One of Selena's favorite quotes was, “You have to believe in the possibility of the impossible.” The beautiful paradox makes concepts of utopia somehow very, very, real. So real, that a Mexican-American family from Corpus Christi, Texas would become a vessel for feminist music history. When Selena met husband, Chris Perez, it was because he’d started playing guitar in the band. Again, another example of how Selena broke the limits of masculinity and typical power dynamics, as an extroverted and charismatic matriarch marrying her guitar player. She led a wave of history. Selena's music fought for the idea that music comes directly from the soul and then sets on the mind. She faced discrimination by both the Latino community and the White community. She was dark skinned, curvy, and often wore jeans and sweatshirts. This not only sets one up for racial profiling on all fronts, but makes the her confidence, assertiveness, and her “I'm not a girlfriend, I'm in the band” position that much more important. In interviews she would mention being the target of racial discrimination and the urgency of making positivity and the future relevant. Selena's passing is to be mourned. She was murdered. But like we should not mourn broken windows, but mourn shattered voice boxes, we must not memorialize Selena. We must recognize the power in the windows of patriarchy and false concepts of beauty that she totally shattered. Selena's former recording studio is still active for many Mexican and Mexican-American musicians. Her brother and sister help to run a windowless museum in the brown grasslands and grey skied, beachside city of Corpus Christi. 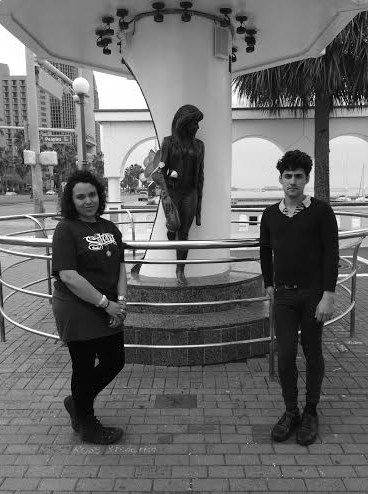 When we had the opportunity to visit the museum on a Downtown Boys tour, we saw the resistance against nostalgia and the urgency to keep Selena alive in our hearts. There was a big Festival de la Flor in Corpus Christi in mid April to celebrate Selena. People from the around the country went. It was sponsored by Citgo, but we live under capitalism. Most of the pictures show Mexican families in complete joy and hope -- breaking holes in capitalism's umbrella, so that we see the light. We have Selena to thank for this. There is a lyric in the song, Como la Flor, where Selena belts, “Me marco hoy,” “ I march today.” She's right. She is marching today. And we should all be, as well.